Furthermore, in 12 of the worst-offending states, religious authorities can put atheists to death for the crime of “apostasy” (i.e. leaving religion; in all cases the religion was Islam). Around the world, the Report found 55 countries with ‘blasphemy’ laws on the books, or other laws forbidding criticism or “insult” to religion. In 39 such countries the law mandates a prison sentence for blasphemers. Three states, Pakistan, Saudi Arabia, and Iran, can execute “blasphemers”. In another three states, militant Islamists acting as religious authorities in some areas are also dealing out Sharia punishment including death for “offences” to religion: namely Al-Shabaab in Somalia, Boko Haram and other Islamists in Nigeria, and the Taliban in Afghanistan. The report’s opening remarks come from two atheists accused of apostasy and blasphemy and now living in exile or in hiding. (The cases of both Alber Saber and Kacem El Ghazzali are also featured in the report). The Report’s editor Bob Churchill, commented, “It may seem strange to see some of these countries up there with Uzbekistan or Ethiopia (also rated “Severe”) but as Kacem and Alber say in the preface, these laws set a trend. Failure to abolish them in one place means they’re more likely to stay on the books in another place, where they can be disastrous. And even in the western countries with blasphemy-type laws there is evidence that they chill free expression, and in some countries, like Greece and Germany, people are actually prosecuted and convicted and do jail time under these laws. 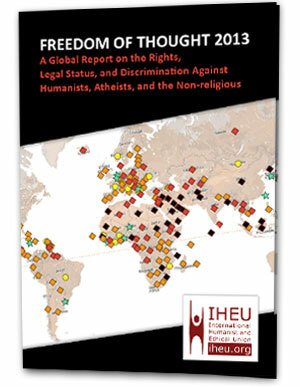 IHEU hopes the report will help shed light on how lesser but systemic discrimination in most countries privileges religion and that it will drive change on the worst violations.